I’m writing to say how much I missed you this Father’s Day. It’s hard to believe that it’s been eight years since I told you how much you mean to me in person. And to think you were so worried about my breast cancer recurring; the thought that your only child and mother of your granddaughters might suffer a long and painful death – as did your own mother – before you died yourself. You did so so suddenly. I’ll never forgive myself for not being there with you, but you kept insisting it was a routine procedure and not to fly home. The carotid artery was 98 percent blocked, you said but, you’d “be fine in no time,” and were looking forward to our visit in August. We’d go to Box Hill for Maryland crab cakes, of course, and eat them sitting in the municipal airport parking lot in Churchville and watch the planes “touch and go.” The girls would sit in rapt attention listening to stories of your wild aviation hijinks and wonder – like everyone else – how you managed to survive. The open cockpit helicopter you built from a kit in your 20s and crashed in a corn field. The ultralights you flew from airport to airport in greater Baltimore with fuel fill-ups and sometimes ran out. The old crop duster Schweizer 300C helicopter you found online and converted into your dream machine. This was all before your first stroke. See? We just never know when our number is up or why it will be called. But, hey, I’m still here, dad! And life is good. You’d be so proud of your granddaughters; both of them graduated college and have wonderful jobs. I finally retired from the TV station and am writing a lot. In just a few months, Gordon and I will celebrate our 31st anniversary. I can still see you waiting in front of the church to help me out of Uncle Bob’s 1937 Chevrolet in my wedding dress. I had only seen you in a suit once, let alone a tuxedo. And when you opened the car door, you started crying like a baby. I lost it. Totally. I figured mom would do all the crying considering she raised me by herself since I was four and I rarely ever saw you even though we all lived in the same small town after the divorce. 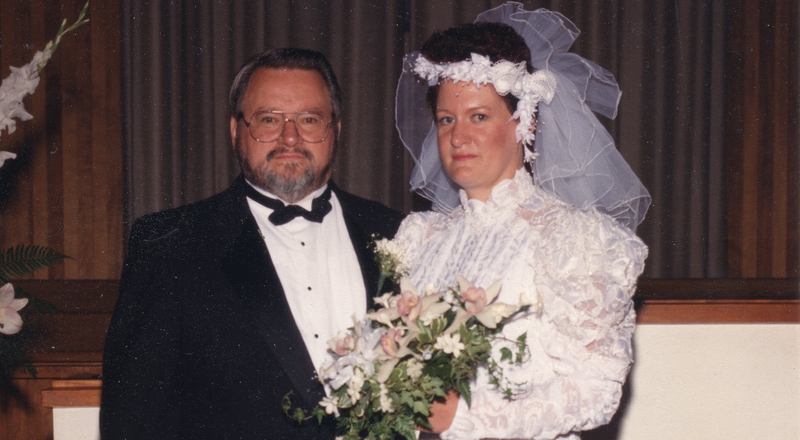 Years later I would come to understand that, on Sept. 12, 1987, at the age of 29, I married my husband and gained a father. Because since that day something changed so profoundly and completely between us; the painful void of your absence during my childhood and teens and early adulthood was miraculously filled with a love so deep and vast that, somehow, it made our remaining years together that much more precious. Life is precious, dad. The weekly phone calls from my new home in New Hampshire, the First in the Nation Primary State? Good Lord, could we spar about politics or what? And sports. I know you were deeply disappointed when I forsook the Orioles and Ravens for the Red Sox and Patriots but, duh! You had to admit, I moved to the winningest sports franchise capital in the country. And then there was your endless fascination with earth sciences and astronomy. I swear you’re coming back as Carl Sagan’s clone in your next life – if you haven’t already. But your biggest joy? Grandchildren. OMG. Never in my wildest dreams would I have guessed that Roy French Choate would be the consummate grandfather. Instead of me calling you a couple times a week, you called me, all the time, asking about Sydney and MacKenzie. It made my heart practically beat out of my chest. In turn, they utterly adored you. And just when it seemed like I had it all – even the white picket fence – I nervously called to tell you the news about my breast cancer diagnosis. I’m sure you remember, there was dead silence on the other end. I said, “Dad, are you there? Are you OK?” And you coughed and said you needed a drink of water and would call me back. But I knew. I knew the cough was really you choking back tears. I regret not being able to tell you in person, but there just wasn’t time. My surgery was scheduled in a week and Sydney was recovering from a tonsillectomy. I needed to be here in New Hampshire with my family. And with you recovering from the second stroke, I really thought it best you stay home, too. Dad, I can honestly say that my first year following diagnosis was as hard on you as it was on me, and I want to remind you, once again, how much that meant to me. I’ll even take it a step further. Your blatant and unabashed inquiry about my health status through the whole cancer ordeal was refreshing. You never beat around the bush or tip-toed around the issue. Nope. You cut to the chase every time and demanded answers. It took some convincing, but you finally came around; you actually began to relax with the knowledge I was heading for the five-year mark. The proof was having a 25-minute phone conversation without cancer being mentioned once. When your friend, Terry, called to tell me she came to the house to check on you the day after you were released from the hospital and found you dead on the sofa, I unleashed a primal wail that seemed to emanate from birth. With cancer, cardiac issues, Alzheimer’s disease, diabetes, amyotrophic lateral sclerosis, Parkinson’s disease, suicide, drug overdose, the human condition is vulnerable. All the heartfelt woes a soul can bear, the human condition knows much sorrow. Life is precious, dad, not perfect. It seems I’ve been toughing it out pretty much my whole life. But I’m grateful for every moment we shared, and I hope somehow you know I’m better than alright. All things considered, your only kid is great and flying higher than even you ever dared.